As you know NEWSTAR LED is promoting their newest design-solar LED flood lights with RF remote, this is design make solar led flood light more smart, you can adjust the brightness if you don't high lumen, so can save more power to light up for a whole night. And our RF remote have two mode, one is Manual mode, another one is Automatic mode, different function with different mode, and very easy to use. •Low energy costs. The sun is well-known for providing solar radiation without charge. •Little maintenance. Solar power products have few moveable parts which means that fewer parts exist to break. They last for a long time and require little attention once installed. •No emissions. 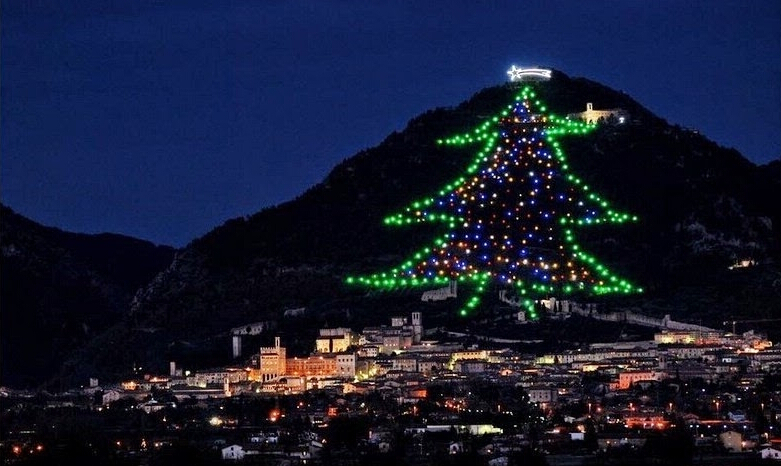 Perhaps the greatest benefits of solar lighting are the environmental benefits. Solar lighting does not contribute to global warming in any way. •Renewable resource. Solar power is a renewable resource. Other energy resources, such as coal and oil, have finite supplies. The power of the sun, on the other hand, will keep on shining, potentially beyond human existence. •With solar lighting there is no risk of electrocution and the lights are cool to the touch, making them safe for children and pets. 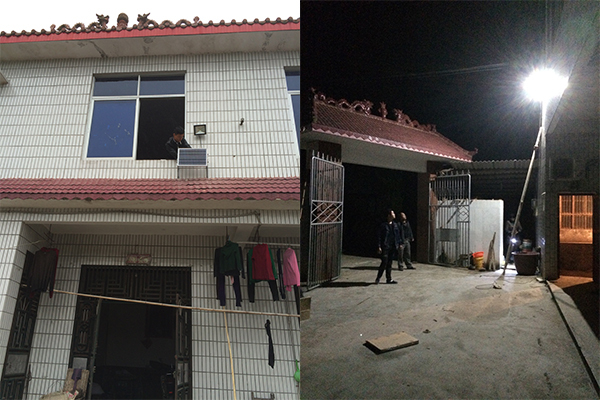 •solar LED Flood lights continue working even if there has been a power outage. Because the energy isn’t coming off of an electrical grid, power outages make no difference. •You can use solar lighting to light homes, cabins, or RVs in remote locations. It can be very expensive to run power lines out to a cabin in the woods. Setting up solar power may be a cheaper, more practical alternative. •Versatility. Solar energy can power many different lighting needs, including walkway lights, indoor lights, security lights, portable spotlight stands, and handheld lanterns and flashlights. 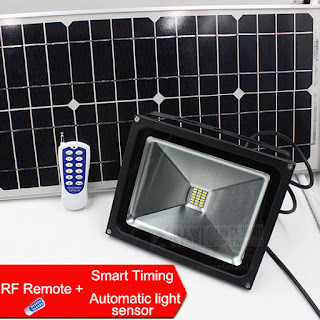 •Another of the many benefits of solar lighting is that most outdoor solar lights have automatic light sensors. There is no need to stress about turning them on or off; it is handled automatically. •Easy installation. The majority of outdoor solar LED Flood lights has no confusing wires that must be connected to your main electrical system. Setting up your lights can be as simple as hanging them on a tree or staking them into the ground. These advantages extend to both the wallet and the environment. In addition to all of this, the benefits of solar LED Flood lights are only destined to increase as solar technology advances. 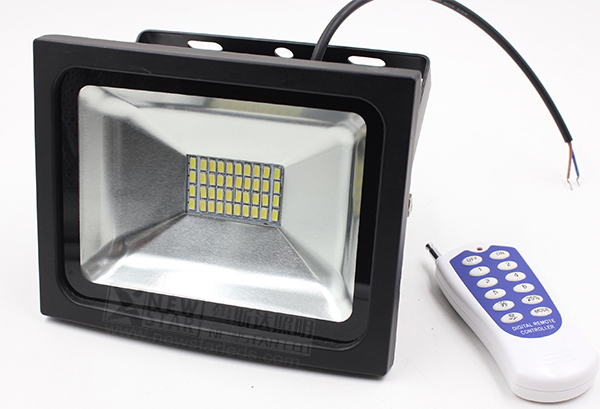 Do you know how did the commercial solar LED flood lights work? Solar LED flood lights work by capturing energy from the sun on an integral or wire connected solar panel. The captured energy is then converted into electricity and stored in batteries. This stored electricity is used to power the solar LED flood lights at night. They can help boost nighttime pedestrian traffic and sense of security. Installing reliable outdoor lighting features can increase pedestrian traffic and help people in the area have a stronger sense of safety and security. This leads to an increase in customer traffic. If customers feel that your establishment has sufficient lighting, they will see this as a safe place to visit and they will be more apt to return. In addition, this can also help boost the morale of your employees since having the right exterior lighting fixtures can provide them a sense of well-being that you provided the necessary lighting to ensure their safety. You also let your employees know that their security is top priority. It can prevent crime against your property and people. Deterring crime is the main role that a solar LED flood light offers. 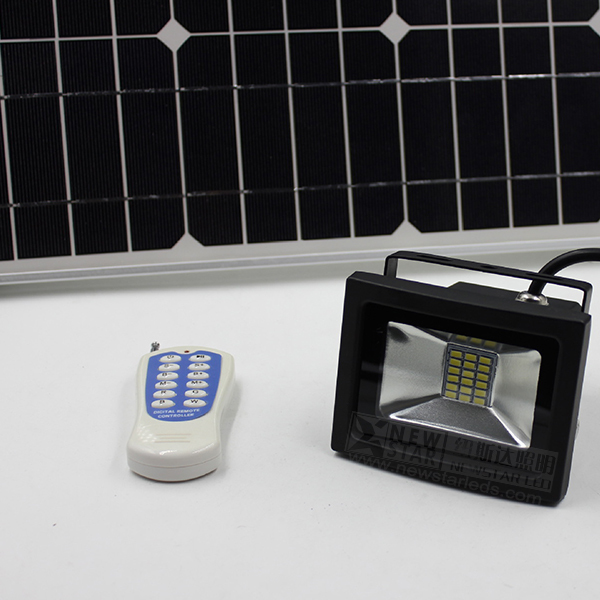 Solar energy permits the LED flood lights to operate even when the power is out. Criminals are not known for operating in areas where they can easily be caught, such as places that have sufficient lighting. Lighting the exteriors of your business premises with good solar powered lighting fixtures that operate no matter what will help deter crime and also provide easy recognition if something still happens. Business owners have the big responsibility of providing additional safety and security at night for their employees, customers and their property. By investing in a reliable and low-cost lighting system, you can easily achieve this important goal. 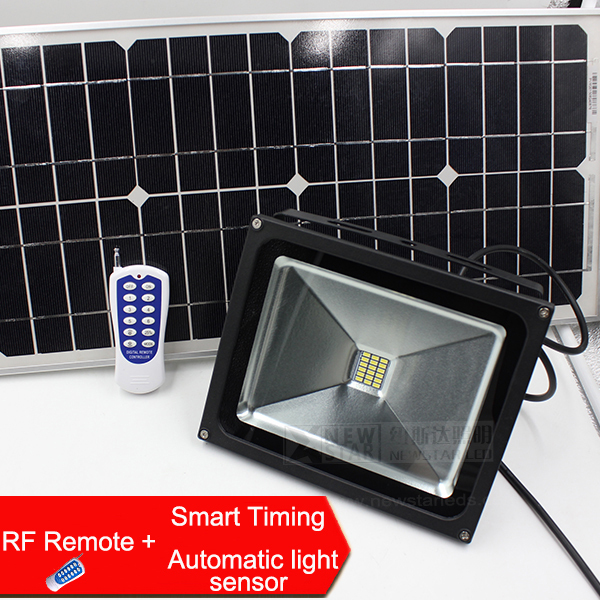 Highly recommended NEWSTAR LED's RF solar LED Flood light. you can adjust the brightness. 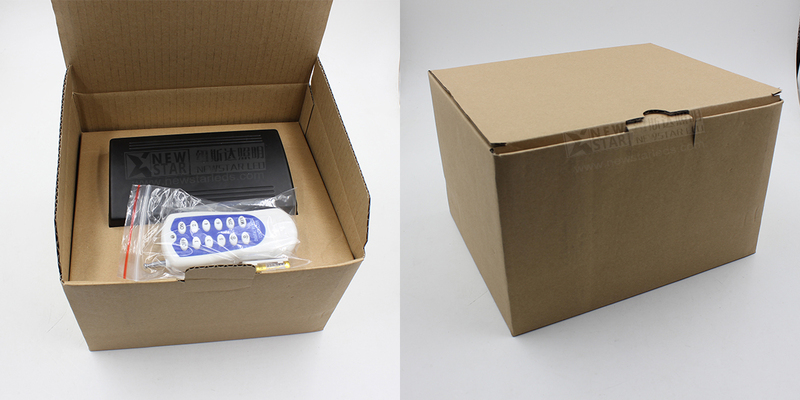 Want to know more details, please contact with us: info@newstarleds.com. With 18pcs Epistar 5730SMD LEDs. Includes Ni-MH 7800mah 7.4Vt battery. This incredibly bright LED solar flood light is powered by the sun and uses a fraction of the electricity of a normal light. Light up flags, signs, house numbers, driveways, porches, statuary, or any large outdoor feature. It lasts virtually forever with no utility charges, ever. 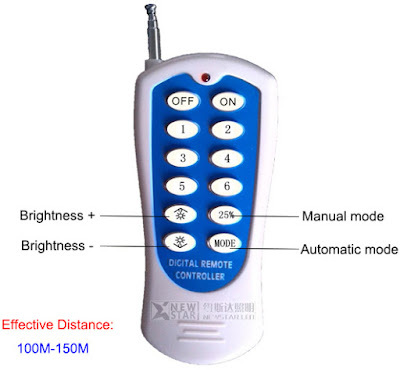 Light stays bright for up to 7 hours at full-power when fully charged, but you can use RF remote to adjust the brightness, or let it turn to work in half power after few hours later(you can set this). 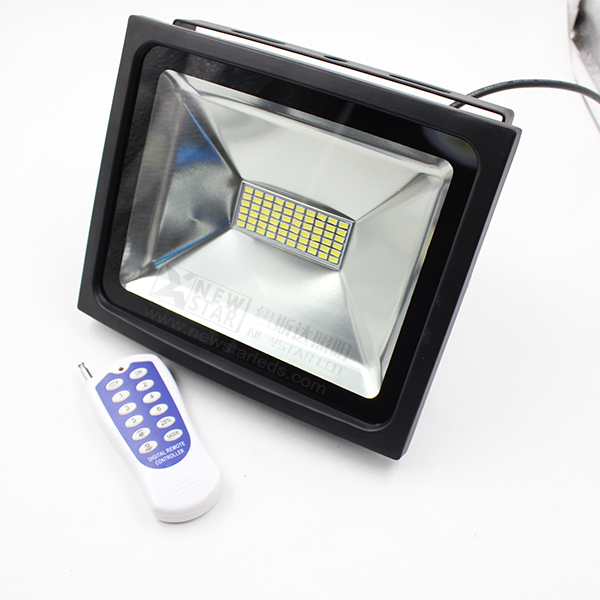 If you wan to know more details about our RF Solar led flood light, please contact with us at once, info@newstarleds.com, this is a good chance to expand your business in the solar lighting area, we are looking forward to get your inquiry. 2, If you need longer cable wire on the LED flood light, add $0.5 cost per meter, the Max length only 5M. 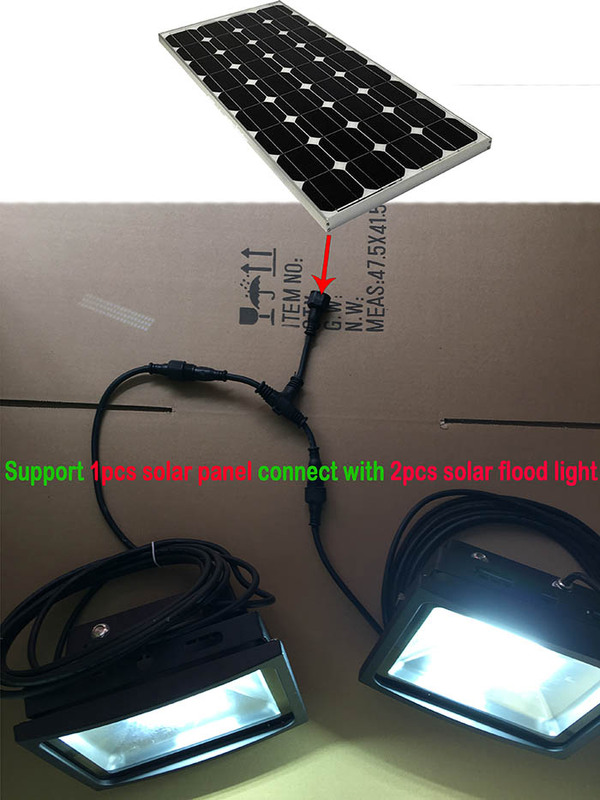 3, Support One solar panel connect with Two LED flood light, the one-in&two-out connecter is available. NEXT: CCT adjustable LED Lights can protect our health!